Van Wyk–Grumbach syndrome (VWGS) is characterized by juvenile hypothyroidism, delayed bone age, and isosexual precocious puberty. We report the case of a 7-year-old girl who presented with premature menarche, short stature, and isosexual precocity. She had delayed bone age and multicystic ovaries. High circulating levels of thyroid-stimulating hormone (TSH) with prepubertal luteinizing hormone confirmed the diagnosis of VWGS. High circulating levels of TSH acting directly on follicle-stimulating hormone receptors could be the mediators of precocity. VWGS syndrome is quite rare and needs to be suspected for prompt treatment and resolution and avoidance of unnecessary surgery. In 1960, Van Wyk and Grumbach described the association of hypothyroidism and precocious puberty. Van Wyk–Grumbach syndrome (VWGS) presents as precocious menarche, breast development, galactorrhea, delayed bone age, and multicystic ovaries in combination with long-standing primary hypothyroidism. Hypothyroidism leads to delayed bone age and a reduction in growth rate by reducing the amplitude of growth hormone pulses. 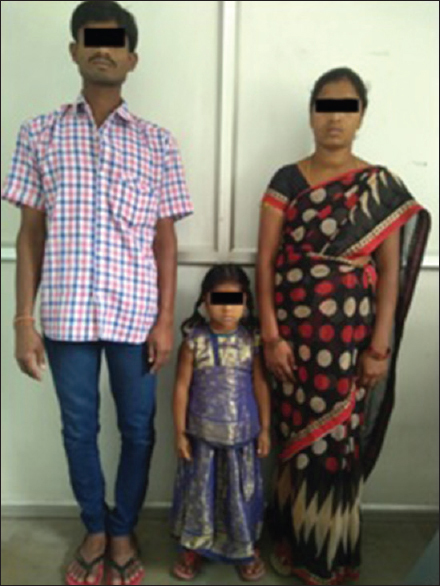 We report the case of a girl with long-standing, untreated hypothyroidism who presented with precocious puberty and short stature. A 7-year-old girl presented with menarche 3 months back. She had been having regular menstrual cycles with average flow. She was born of nonconsanguinous marriage at full-term, normal vaginal delivery, and was first in the birth order. Her birth weight was 2.5 kg, and she had normal developmental milestones. 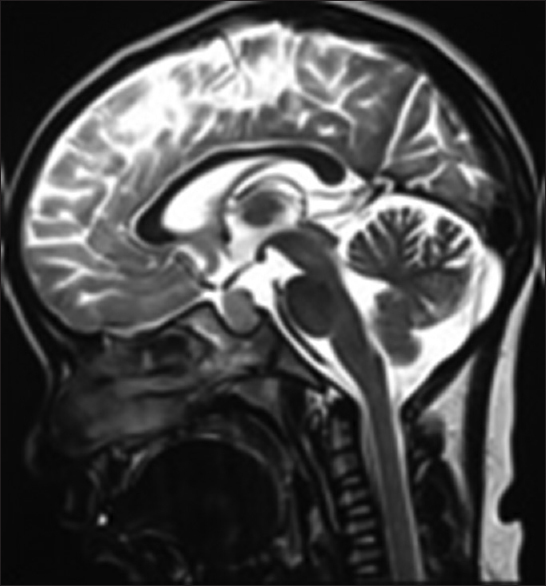 There was no history of headache, vomiting, visual symptoms, or gelastic seizures. Her appetite was normal, and she did not have excessive sleep, cold intolerance, or constipation. Her scholastic performance continued to be average. Her height was 95.7 cm (<3rd centile) and weight was 14.6 kg (<3rd centile) [Figure 1]. Her pulse rate was 68/min and blood pressure was 98/60 mmHg. She had pallor and dry scaly skin. There was Grade I goiter. On Tanner's staging, she had prepubertal breasts and no axillary or pubic hair. She had normocytic normochromic anemia with a hemoglobin level of 10 g/dl (normal 12–14 g/dl). Hormonal investigations revealed thyroid-stimulating hormone (TSH) >100 μIU/ml (0.35–5.5), T3 41.5 pg/ml (60–181), T4 1.5 ng/ml (4.5–12.6), and follicle-stimulating hormone (FSH) 9.04 mIU/ml (0.3–2.0), luteinizing hormone (LH) <0.85 mIU/ml (0.1–6.0), and prolactin 132.2 ng/ml (2.8–29.2). Her radiological investigations revealed a bone age of 4 years (Greulich and Pyle's Atlas More Details). Ultrasonography of the pelvis showed a uterine size of 4.2 cm × 2.7 cm × 1.4 cm with enlarged multicystic ovaries. The magnetic resonance imaging of sella, which the patient had brought with her at presentation, revealed a sellar-suprasellar mass lesion showing bilobed/dumbbell “figure of 8” configuration with waisting at the level of diaphragm sella 1.6 cm × 1.2 cm × 1.9 cm size [Figure 2]. This finding had prompted referral to the neurosurgeon for surgical consideration in the first place, before the case was referred to endocrinology for further evaluation. Antithyroid peroxidase antibodies were not done due to financial constraints. She was diagnosed to have VWGS with feedback pituitary hyperplasia. We started her on thyroxine replacement and she has been advised to follow-up with her thyroid function tests after 2 months. Primary hypothyroidism usually presents with manifestations such as weight gain, poor concentration, depression, fatigue, muscular weakness, menstrual irregularities, and short stature. Rarely, it can present as VWGS. VWGS presents as precocious menarche, breast development, galactorrhea, delayed bone age, and multicystic ovaries. The patient described in this case report also had incomplete isosexual precocious puberty manifesting with menarche. In girls, the condition usually presents with vaginal bleeding and uncommonly with breast development or galactorrhea. Boys have macroorchidism without significant signs of virilization. The salient diagnostic features include long-standing hypothyroidism,, high levels of TSH, isosexual precocity with lack of public and axillary hair growth, and delayed bone age. The most common cause of hypothyroidism in these patients is autoimmune thyroiditis. Sella turcica enlargement may be seen and it has been attributed to thyrotroph hyperplasia. Van Wyk and Grumbach postulated a lack of specificity in the feedback mechanism leading to an overproduction of multiple hormones. The serum gonadotropin levels in these patients are relatively low for their degree of gonadal stimulation. Thus, elevated gonadotropins alone cannot completely explain the gonadal stimulation seen in severe juvenile hypothyroidism. High circulating levels of TSH acting directly on FSH receptors may be the actual mediator of precocity. Low FSH-like activity of TSH can be clinically significant at very high concentrations of TSH. This leads to overproliferation of Sertoli cells More Details and responsible for macroorchidism in males. In females, the multicystic ovaries may result from elevated levels of circulating gonadotropins or via increased prolactin. However, ovarian enlargement may be secondary to a myxedematous infiltration. Our patient also had multicystic ovaries with normal to low gonadotropins, suggesting that the increased sensitivity of ovaries to gonadotropins may be responsible for it. A gonadotropin-releasing hormone (GnRH)-independent mechanism may be a possible explanation, because GnRH did not suppress the pubertal LH levels. It has also been shown that the FSH response to thyrotropin-releasing hormone (TRH) is augmented in primary hypothyroidism. Hence, another theory for the possible mechanism of precocity here could be that the incomplete sexual precocity and the increased prolactin secretion and galactorrhea are a consequence of the increased release of TRH, the increased sensitivity of the mammotrophs and gonadotroph to TRH, or both. This mechanism would also explain the relatively rapid and complete reversal of the syndrome by levothyroxine treatment. In patients with isosexual pseudoprecocity, the presence of palpable adnexal mass would suggest ovarian tumors; however, in all such cases, the bone age is advanced. Hence, the presence of a delayed bone age in patients with precocious puberty is an important clue for the diagnosis of VWGS. All symptoms subside with thyroxine replacement, the endocrine abnormalities resolve, and even the ovarian cysts decrease in size or altogether disappear. Hypothyroidism is a common endocrine disorder that rarely presents as VWGS. VWGS is easily reversible by early diagnosis and adequate thyroxine therapy. High clinical suspicion, early diagnosis, and treatment can avoid unnecessary imaging and surgical intervention. This syndrome, when untreated, leads to short stature and psychosocial impairment. We report this interesting association between hypothyroidism and precocious puberty with feedback pituitary hyperplasia as it would help clinicians in the early diagnosis and avoidance of unnecessary surgery. Van Wyk JJ, Grumbach MM. Syndrome of precocious menstruation and galactorrhea in juvenile hypothyroidism. An example of hormonal overlap in pituitary feedback. J Pediatr 1960;57:416-35. Styne DM, Grumbach MM. Puberty: Ontogeny, neuroendocrinology, physiology and disorders. In: Kronenberg HM, Melmed S, Polonsky KS, Larsen PR, editors. William's Textbook of Endocrinology. 13th ed. Philadelphia: Saunders (Elsevier); 2016. p. 1190-2. Lindsay AN, Voorhess ML, MacGillivray MH. Multicystic ovaries in primary hypothyroidism. Obstet Gynecol 1983;61:433-7. Evers JL, Rolland R. Primary hypothyroidism and ovarian activity evidence for an overlap in the synthesis of pituitary glycoproteins. Case report. Br J Obstet Gynaecol 1981;88:195-202. Gordon CM, Austin DJ, Radovick S, Laufer MR. Primary hypothyroidism presenting as severe vaginal bleeding in a prepubertal girl. J Pediatr Adolesc Gynecol 1997;10:35-8. Anasti JN, Flack MR, Froehlich J, Nelson LM, Nisula BC. A potential novel mechanism for precocious puberty in juvenile hypothyroidism. J Clin Endocrinol Metab 1995;80:276-9. Jannini EA, Ulisse S, D'Armiento M. Thyroid hormone and male gonadal function. Endocr Rev 1995;16:443-59. Chattopadhyay A, Kumar V, Marulaiah M. Polycystic ovaries, precocious puberty and acquired hypothyroidism: The van Wyk and Grumbach syndrome. J Pediatr Surg 2003;38:1390-2. Hansen KA, Tho SP, Hanly M, Moretuzzo RW, McDonough PG. Massive ovarian enlargement in primary hypothyroidism. Fertil Steril 1997;67:169-71. Bhattacharya M, Mitra AK. Regression of precocious puberty in a child with hypothyroidism after thyroxine therapy. Indian Pediatr 1992;29:96-8.